After a short 3.5-hour flight from Sydney (only 2 hours from Auckland) with Air Vanuatu, we arrived in Port Vila, Vanuatu’s capital and largest city. Vanuatu is made up of 83 islands with a total population of 260,000. Almost a quarter of the population live in Port Vila but the town itself is considered small, with only one main street running along the shore line. Don’t let that put you off as the friendly locals will make you feel right at home in no time, as they do call Vanuatu one of the friendliest countries on this planet. 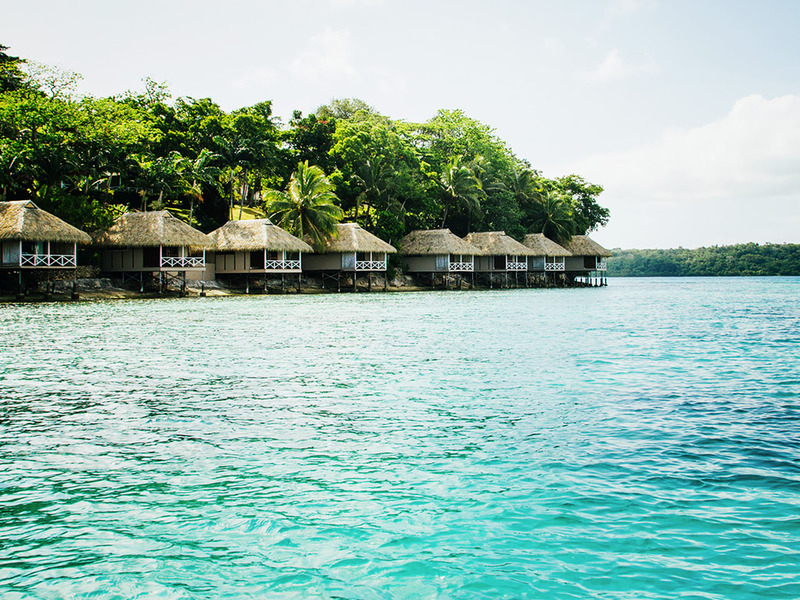 Expedia’s Aussie travellers spend 4-5 nights in Vanuatu and Port Villa is a popular stop before heading off to explore the islands. Staying at Iririki Island Resort & Spa brings our trip a step closer to paradise. It’s a unique island retreat just off the main island and is only accessible via a free boat ride available 24/7. Set amongst a spectacular tropical landscape, Iririki provides the perfect balance between peaceful getaway and conveniently base. While my tropical island fare (bungalow) offers a glimpse of the water, why should I stay indoors when I can spend the time outdoor and submerge myself in a landscape that looks like it’s straight out of a postcard? Port Vila might be a small town but when it comes to food, it is a huge culinary melting pot with an exciting mix of Melanesian, French, Chinese, Mediterranean and Italian cuisine, just to name a few. Watermark Restaurant at Iririki Island Resort has taken traditional Melanesian cuisine in a whole new contemporary direction by offering a unique Real Pasifik Banquet every Thursday night. Guests get to experience a delectable modern Melanesian-inspired menu, created by award winning celebrity chef and cookbook author Robert Oliver from New Zealand. 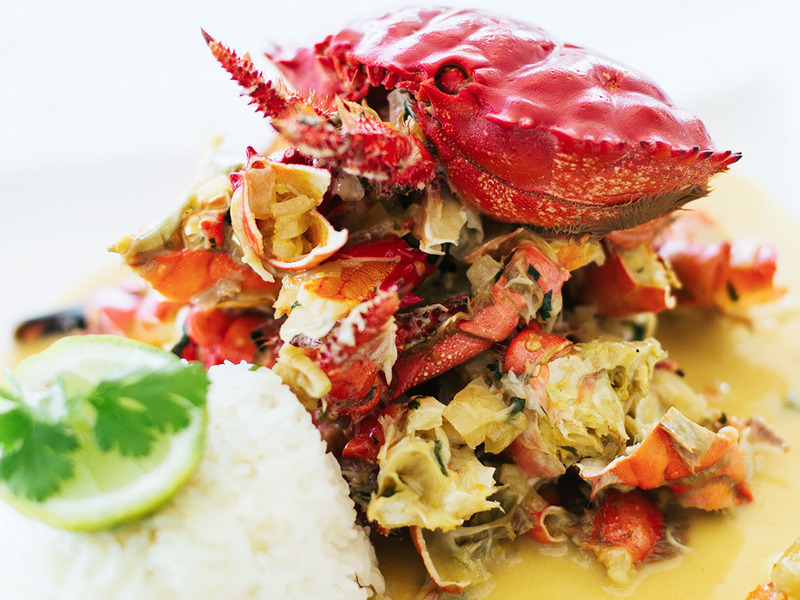 Robert has redefined a few Melanesian classics including Lap-Lap, giving dishes a facelift suitable for fine dining, without losing the traditional cooking method of using hot stones. The stone grilled local Santo beef is simply to die for. The local beef is arguably some of the best in the world and the only way to really enjoy the quality of the beef is by having it raw. The beef carpaccio at the newly opened Au Fare’ restaurant is a must try – the wafer-thin slivers of red meat simply melt in the mouth. 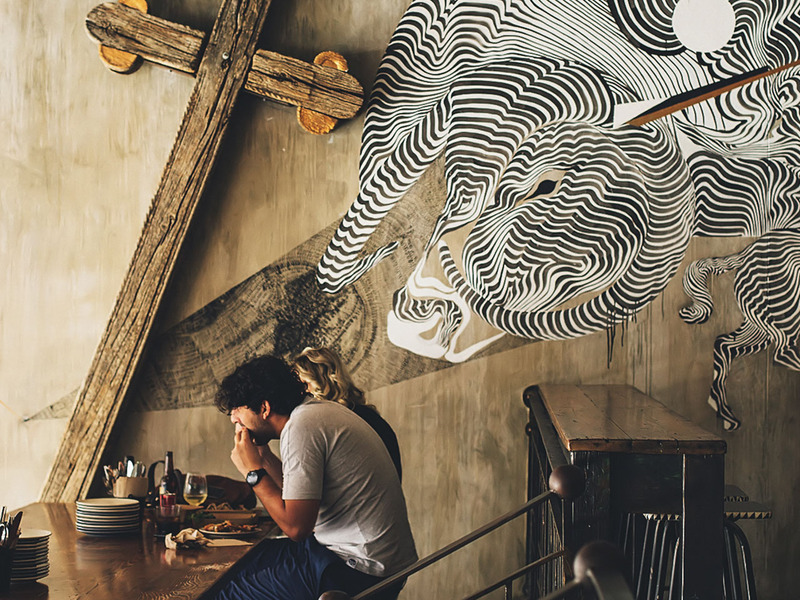 Frequented by the expats, Au Fare’ is the most happening venue right now at Port Vila. Enjoy the magical views from the waterfront deck over Port Vila harbour while enjoying a scrumptious meal or sipping a cocktail. In the evening, the restaurant slowly turns into a mosh pit where patrons start to dance the night away to the beat of live music by local artists. On Saturday nights, guests are also treated to a high energy Fire Dance show of spinning flames, fireworks and flame dancers on a floating pontoon. While most of the locals speak Bislama and English, visitors will notice a French influence in street and place names and in the cuisine. Make sure to grab a huge, fluffy, buttery almond croissant from Au Péché Mignon, “the little sin” that you can’t resist. If you’re looking for classic French fare, perhaps pay the kitsch L’Houstalet French restaurant a visit and prepare to bewildered by the decor in the restaurant that possibly hasn’t changed in 45 years. L’Houstalet is a local institution with a significant history. This is the spot where the country made the first decisive step towards independence on 19th September 1979. The restaurant is well known for its tender grilled steak (with blue cheese sauce) and prawns flambé (a long skewer of king prawns is engulfed in flames right in front of diners). I’ve been tipped off by a friend to come here to try their most unconventional dish – flying fox. The dish comes with a whole bat (thankfully head and wings have been removed) braised in dark rich red wine jus. It isn’t a pretty sight. Looking at it is enough to turn any stomach upside down. The meat has a flossy texture similar to duck but with a strong gamey flavour that’s fairly overpowering. I’m happy to say I tried it but possibly never again. It’s definitely not for the faint-hearted. For coffee aficionados, a tour to Tanna Coffee Roasting Factory should be compulsory. All their coffee beans are grown in Tanna Island (hence the name) under the shadows of the still-active Yasur volcano where the deep, rich soils, abundant sunshine and plentiful rainfall are the very essence that give Tanna Coffee that robust flavour. If coffee isn’t your thing, drop by The Brewery Bar & Restaurant for a pint of local Nambawan beer and watch the world go by. 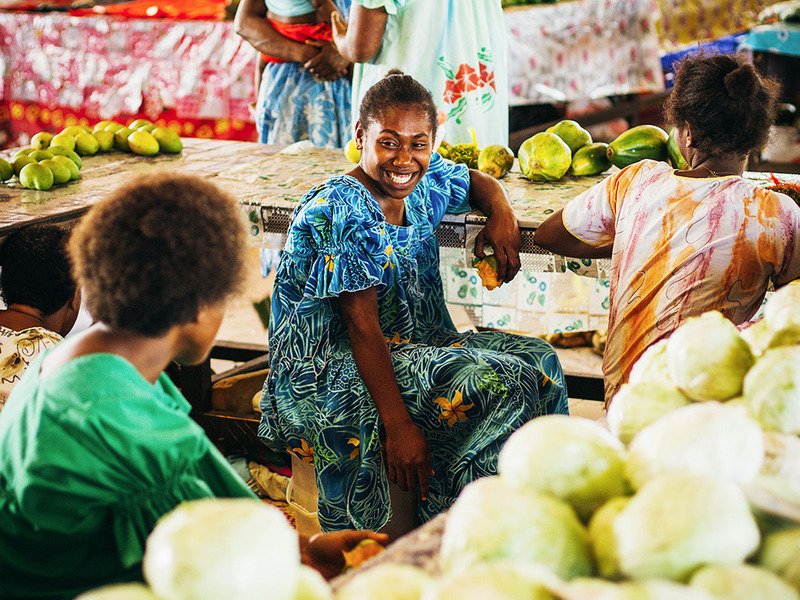 A visit to Port Vila is not complete without checking out the local market. I had the privilege to meet Vanuatu’s queen of cuisine, Voutasi Mackenzie-Reur who was happy to show me around the market. I then followed her home to Lapita Cafe, where we prepared a Melanesian feast in her traditional outdoor kitchen and also sampled a few of her gluten-free products made from manioc (tapioca) flour. With a nutritionist degree under her belt and having worked as a chef, Voutasi is passionate about promoting local produce and tries to convince locals to get more traditional root crops back into their diets to improve health as well as boost growers. Trust me, spending an afternoon with her will be one of the highlights of your trip. After eating my way around the whole of Port Vila, there is nothing else I could think of doing except spending the rest of the afternoon sailing on the still waters of Mele Bay with Meridian Charters, sitting back and relaxing with a glass of champagne while the sun slowly sets over the South Pacific ocean. I only have myself to blame for consuming all the good food. Abseiling down the waterfall with a few extra pounds doesn’t seem like a good idea anymore. A thrilling yet terrifying hour later, I eventually make it to the bottom of the waterfall and plunge into the rockpool safe and sound. By now I simply can’t wipe the smile off my face – no wonder they called Vanuatu the happiest country on earth.